Nowadays QR Codes are becoming more and more popular on ads, banners, all kinds of product boxes, websites, business cards and even in email signatures. It contains text, links, email addresses, phone numbers, vcards and more. 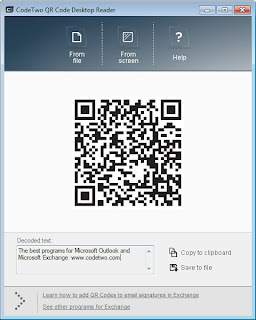 CodeTwo QR Code Desktop Reader is a free tool that will let you quickly scan any QR Code from your screen – be it a part of the website, email, banner or a document. Simply run the program and hit From screen on the top menu. Your standard mouse cursor will change into a cross to help you make a selection on your screen. 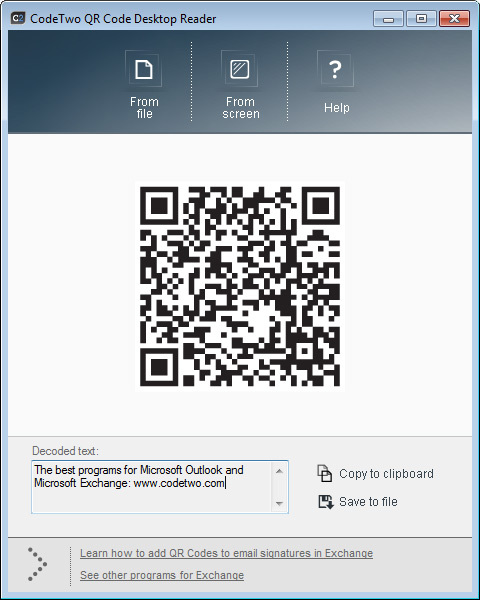 Simply select an area with a QR Code and the program will automatically scan it. 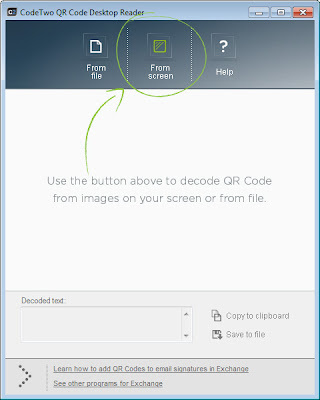 Now you can simply copy decoded text to clipboard or save it to a file. You can also select an image file that contains a QR Code from your hard drive by clicking From file option. It supports Windows XP / Vista / 7 / 8 Windows Server 2003 / 2008 .NET Framework 2.0 SP1 operating systems.